I’m really excited to finally share with you my checklist of things you can do in your garden this year in order to ensure your fruits and vegetables provide you with as much nutrition as possible. Lesson 1. I’m really embarrassed that I got the flu this winter, and I’m going to do everything I can to expand and improve my organic food garden this year so I have enough nutrient-dense food next winter to make sure that flu doesn’t happen again, not to mention other more serious diseases. Lesson 2. The benefits of implementing this checklist are: food that is much higher in nutrition, with considerably better flavor, sizeably greater yields and substantially longer storage life. The main goals of the checklist are to increase the number and diversity of beneficial organisms in our gardens along with the nutrition – in short, the biology and chemistry. Lesson 3. Plants manufacture many important compounds for their own health, which are also important for our health, but they need an optimal environment to do so, and that’s what the checklist gives them. The list tends to start with more biology-focused practices and gradually move towards more chemistry-focused practices, but many of the steps hit on both. Compost. This one’s always near the top of the list. Although compost certainly brings in nutrition that can improve soil chemistry, the main reason we use it is to bring in the beneficial biology that improves the soil, feeds plants and controls pests. Even 1/4 inch dusted over the soil is plenty, but it needs to be good compost, which is why it’s very worthwhile to make your own in the long run. If you’re not currently composting, I encourage you to make that priority #1 – a little goes a long way. Compost tea. Even though I use compost on the soil, I still spray compost tea onto the leaves of my plants a couple of times a year. This is how you turn a tiny amount of compost into a potent probiotic that can shift the biological balance of your soil and feed and protect your plants. 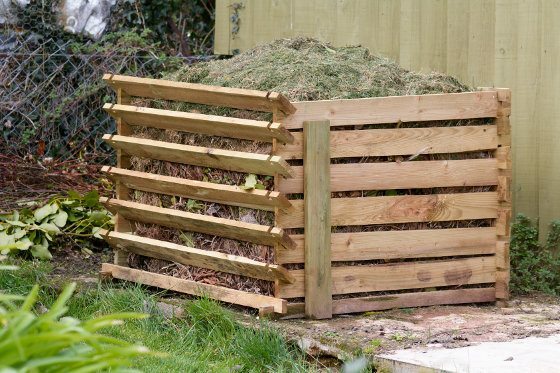 Put a small amount of good compost into a bucket of clean water, add some microbe foods like molasses and liquid kelp, and aerate the whole mixture with an air pump for 24 hours. Effective microorganisms (EM). This has a much lower diversity of microbes than compost tea, but they’re very important microbes to have. They do a lot of good for soil and plant health. I use effective microorganisms as the base for my monthly foliar sprays – it keeps the garden in good health and helps control a lot of pest problems. Academy member Becky told me “This year my new peach trees are lush and have peaches on them. I use the foliar sprays you suggest and no holes in the leaves like last year. My strawberries now have leaves that are huge and lots of berries coming on. Same with my grapevine. Flowers are happy and so is my lawn.” That’s just one example of how helpful these monthly foliar sprays can be. Mycorrhizal fungi. I apply these fungi every time I plant any plants or sow any seeds. They protect plants from soil predators and bring nutrients and water right into the roots. I use a mycorrhizal product for this because it makes it easier, but it’s also possible to gather a handful of soil from a natural, healthy ecosystem that’s similar to the one you’re creating in your garden, and use that as your inoculant. Herbal tea. Loosely fill a bucket with weeds, then with water. Cover it with a tight lid and let it ferment for a few days or weeks. After that, strain out the weeds and mix the remaining liquid with 10-20 parts water before watering your plants. It stinks, but the nutrients give plants a boost, and some teas even help with disease. Urine. By my math, peeing once or twice a year on each 5 square feet of your garden will supply all of your nitrogen needs, plus some other nutrients. If you have plants in the garden, mix the urine with 20 parts water first and water with that. If you’re healthy and not on toxic medication, your urine is also non-toxic, so there’s nothing to worry about. When I’m building a new garden, one of my earliest steps is often covering it with as many leaves as I can find. Mulch. If I have the option, my favorite mulch is any kind of leaves that have fallen on the property in autumn. They break down slowly, enriching the soil, controlling weeds and conserving moisture. If you don’t have leaves, straw is an okay second choice. 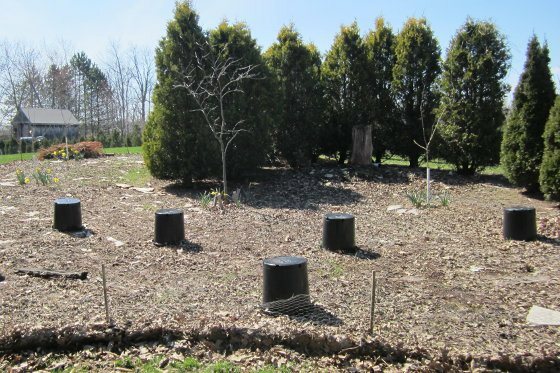 Wood chips can work too, but more so on perennial plantings than annual vegetables. Cover crops. Cover crops do even more to improve garden health than mulches do because of how their can roots improve the soil, often deeply, and how their shoots can attract beneficial insects and repel pests. Common legumes are vetch and clover. Common grasses are annual ryegrass, cereal rye and oats. They’re often mixed. Beneficial plants. Most of the plants I put into my garden, if they’re not providing a benefit directly to me, are providing a benefit to the garden. I suggest planting a lot of legumes because they bring nitrogen into the soil (examples are lupin, clover and vetch), ‘accumulators’ that make available other nutrients (examples are borage, yarrow and nettles), and plants that attract beneficial insects and repel plant predators (especially herbs such as mint, dill and marigold). Garlic. If I had to choose one beneficial plant, garlic would be the one to plant liberally throughout your garden. It attracts beneficials, repels pests and can be used throughout the year as a highly potent medicine for you. Plus, you can make an effective natural pesticide from garlic. Crush 1 medium clove and marinate it in 1/2 tsp of vegetable oil for at least 24 hours. Then add 1/2 tsp of soap and mix well in 1 liter of water. Spray on the infested plants in the morning. Ocean water. This is my favorite fertilizer. Ocean water has 90+ elements in it plus beneficial biology, so applying it to your soil and plants is an exceptional way of bringing more nutrition into your food. I use a highly concentrated ocean water fertilizer, but if you live by the ocean you can use 5 liters of ocean water mixed into 50 liters of water per 1000 square feet, 4 times a year. With the product I use I need only ⅓ cup per 1000 square feet, about 60 times less than straight ocean water because the product is so dense. I often combine this with the EM for my foliar sprays. Academy member Jo told me “We have now done the foliar spray twice on the winter crops and the results are pretty spectacular. I had to go back and do a third hit on the curly kale, which was not doing much, but it is now jumping.” I especially like foliar sprays during those first few years in a garden when I’m working to improve the soil but it’s not there yet. Rock dust. This is simply rocks that have been ground up into a powder. Look for a volcanic or glacial dust, as they have the most nutrition. Even just 50 pounds of rock dust spread out over 1000 square feet will bring in a huge array of minerals. If you’re willing to do a little searching, you can get it from a quarry in bulk to save a lot of money, or you can buy it in bags, which is fine for a small garden. 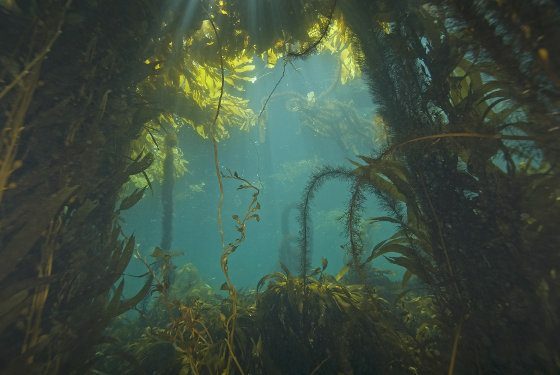 Seaweed helps plants deal with many stressors. Seaweed. Again, if I still lived by the ocean I would go get some seaweed. It’s about the most perfect source of organic matter there is for mulching the soil and putting into a compost pile. Since I’m landlocked, I use a concentrated liquid seaweed fertilizer to bring those nutrients and other beneficial compounds onto my plants where it helps them deal with many environmental stressors. My soil doesn’t benefit as much as if I were mulching it with seaweed, but my plants get instant, same-day benefits. That’s what’s nice about doing foliar fertilizing. Neem oil. Neem oil seems to act as a biostimulant that helps improve plant health while also controlling insect and disease pests. I’m careful applying anything that kills garden pests, but I haven’t found evidence that it’s harmful to beneficials such as bees and butterflies, and I’ve seen how plants respond positively to neem oil, so I’ve started using it twice per year in early and late spring. You want cold pressed, pure neem oil. Soil test. A lot of people skip doing a soil chemistry test, but it’s the only way to know which specific minerals your soil needs more of, i.e. in quantities greater than the above fertilizers provide. That’s where rocks such as gypsum come in handy, but generally only when you know you need them. You can send a soil sample to an organic lab and they’ll help you make fertilizing decisions, or if you’re in my Academy, you can send it to me. Calcium and phosphorus. For people who simply aren’t going to do a soil test, I recommend incorporating 10 pounds of calcium carbonate and 5 pounds of soft rock phosphate per 1000 square feet into the top few inches of soil, ideally along with some compost. These two nutrients are usually deficient, and vital for plant health. Water. I saved the most important for last. No amount of compost, microbial inoculant or organic fertilizer is going to get your plants to optimal health unless they have optimal water. By implementing the items in this checklist you’ll be dramatically improving soil water holding capacity, but in the meantime, make sure you do your best to supply it. So, those are the steps I’m excited to get working on in my garden next month. I’d be incredibly grateful if you’d share this with someone who you think would benefit from it, using the buttons on the far right side of this page (or the bottom if you’re on mobile). I hope you’ve enjoyed this series and will benefit from this checklist this year. If you want to delve a little deeper into all of this, you can download my free ebook right now on the right side of this page (or scroll to the bottom if you’re on mobile).